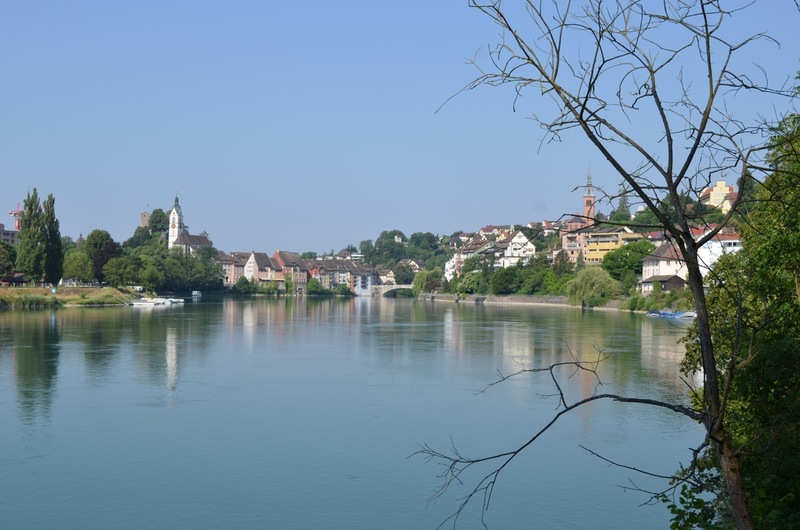 Hot hot hot (to Basel) – for people. for nature. We woke up in the cycle tourist encampment at the ungodly hour of 6 am this morning. Barbara, our friend from last night got up after us, but she was the first one rolling out of the gate. So efficient! We did ok ourselves though and were on the road by 7. We crossed back to the Swiss side to get back on the route, but this subsequently turned out to be unnecessary. Then we crossed back to the German side and went to the shops, which took ages. After these delays we finally got moving, and we were heading along a gravel track when someone wheeling a bike along started shouting to us in German. Anna used her special translation abilities to discern that the lady wanted a bike pump. Her name turned out to be Rosa, she was 76 years old, and she was riding a bike with a tyre way too big for the wheel. The tyre had popped of the wheel and she was stuck. She said she only had four kilometres to go, so we checked the inner tube for punctures, replaced the tyre and pumped it up. Rosa went off happy while we were packing the pump away, but we soon caught up with her in an even worse mess. 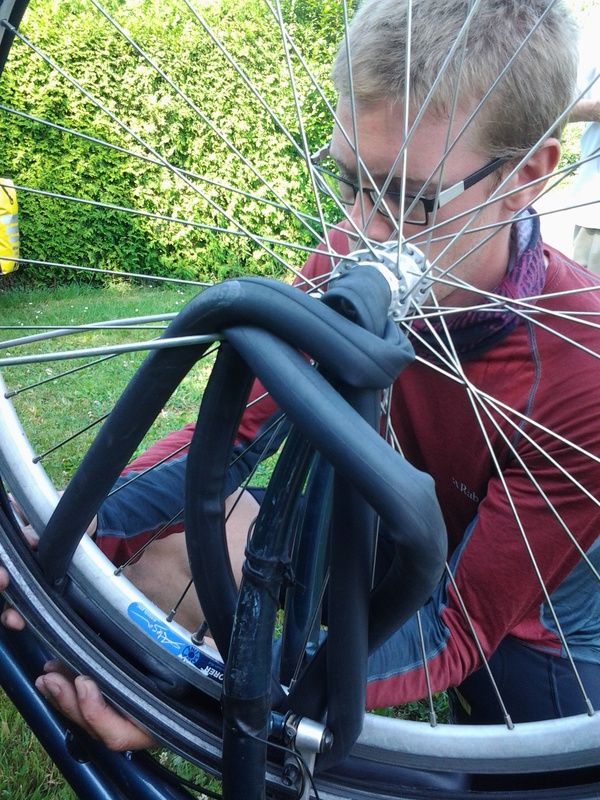 This time the tyre had popped off the wheel and the inner tube had got tangled through the brake blocks and around the mudguard. We sorted it out and persuaded her that she should really walk the rest of the way to avoid terminally injuring herself the next time the wheel dismantled itself. She agreed and we left her to it. We were very late for our food break at this point, and very delayed in our projected progress, so tempers were frayed to say the least. We had a good sulk and argument over lunch and cleared the air a bit. Just after that we saw the longest wooden bridge in Europe, which was nice. 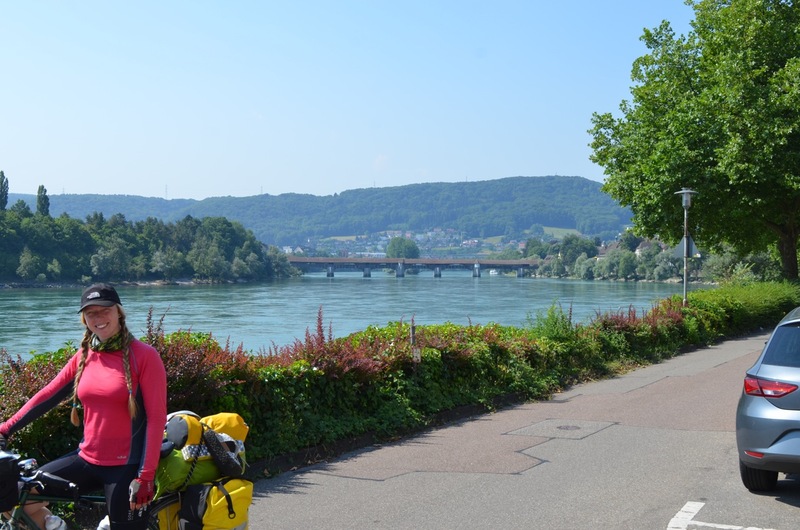 We set off again hoping to make it to a campsite on the river near Basel. 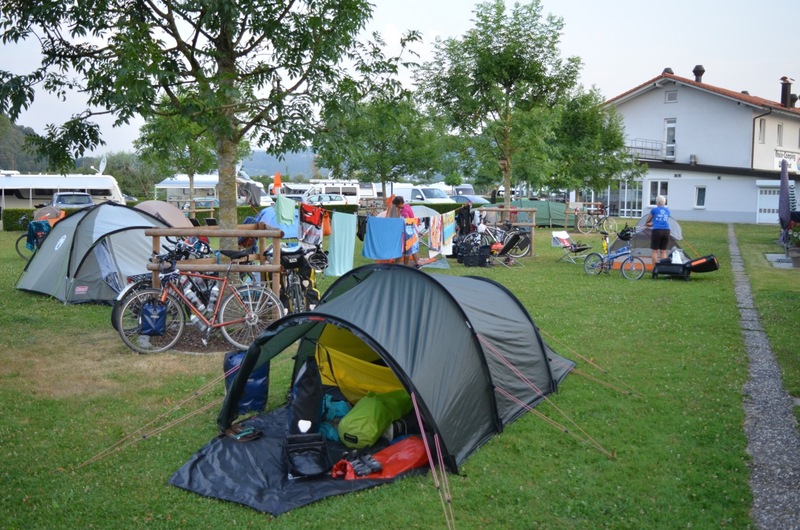 When we finally arrived hot, tired and thirsty we found that the campsite was shut and entry was “verboten”. 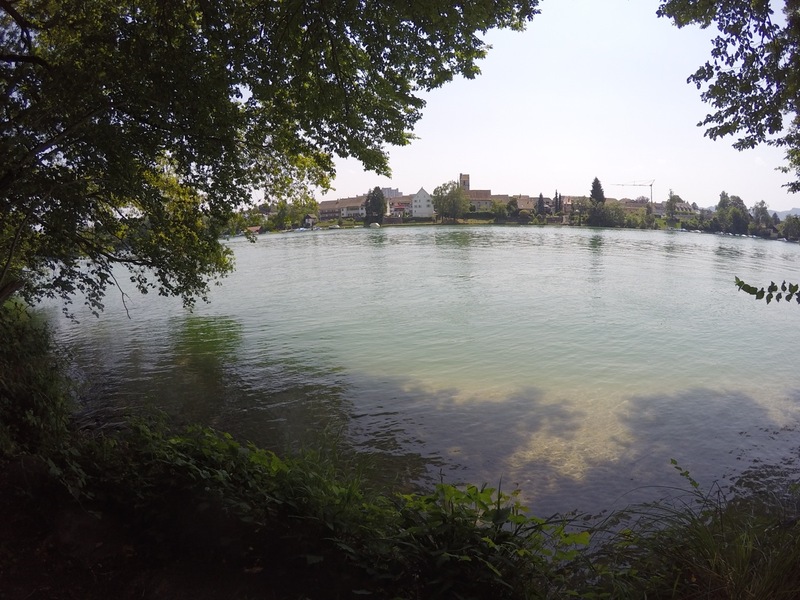 We went for a swim in the river anyway to cool off, which was just what we needed! Refreshed, we decided we would go to a hostel that was about 12 km away. We stopped in a little village on the way to stock up on food, cash and painkillers. Then we started to tackle the hill that lay between us and the hostel. About half a kilometre up a guy stopped his car, got out and started chatting German to us. It turned out he was telling us that we really, really shouldn’t try to go over the hill. Part of me wanted to say “we’ve been over the Albulapass don’t you know”, but just then a second chap came over and started agreeing fervently with the first. So either there’s a top secret nuclear bunker somewhere around Basel, or it’s a really steep hill. We’ll never know, because we were eventually persuaded to go around on a detour which proved to be ABSOLUTELY MASSIVE. It went back into Switzerland and everything! We were so hot and thirsty that we had to interrupt three kids who were playing in a public fountain in order to fill up our water bottles. About a kilometre out from the hostel the road started rising ominously, and we found ourselves going up an unwanted steep hill. We comforted ourselves that the two guys who’d advised us to take this route had said that it went up “a bit” at the end, and our original route must therefore have been much worse, and well avoided. The hostel is ok, it’s basically a massive castle except built from chipboard. We found out today that hostels in Germany aren’t allowed to have kitchens for people to cook their own food unless they are completely separate from the main building. So most of them, including this one, just don’t bother. This meant we had to cook on a bench outside. We agreed we don’t really see the point of hostels without kitchens, as Anna said, “it’s basically a rubbish hotel”. Quite. 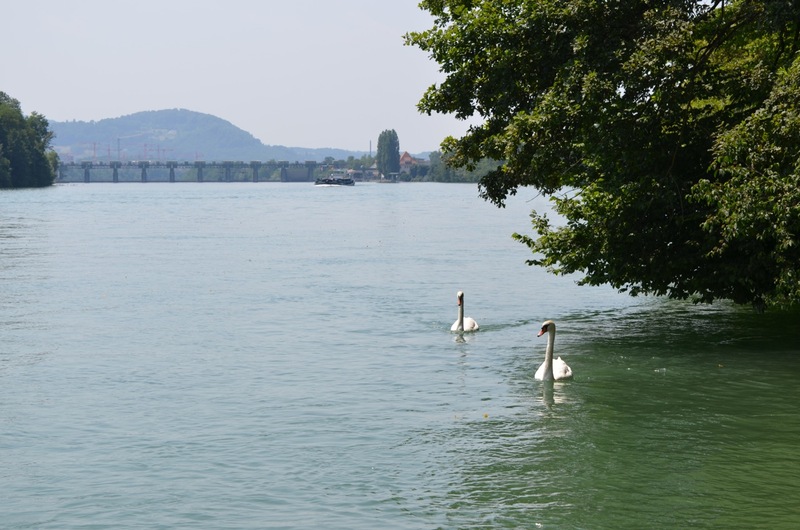 After following the Rhein for a few days we’ve decided that it’s going to be a bit boring to just follow it all the way to the Netherlands. We’re thinking about a detour through the Black Forest to change the record a bit.